Women's track celebrates its indoor championship Saturday. 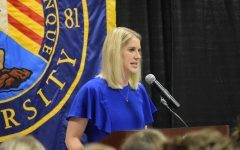 In the course of a calendar year, the Marquette women’s track and field program produced dozens of school records, personal best and team titles, but their latest accomplishment may be the sweetest yet. The Golden Eagles breezed through the field on their way to their second straight BIG EAST indoor conference championship and third conference championship since 2016. 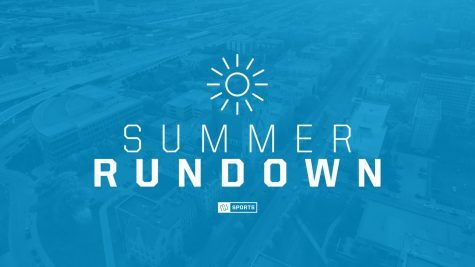 Heading into the final day of competition, Marquette was down one single point to Villanova, consistently one of the team’s biggest competitors. 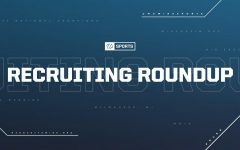 The two schools have finished 1-2 overall in two out of the last three seasons. 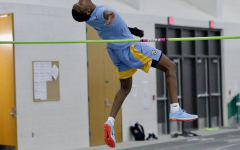 However, thanks to the efforts of the high jump team, Marquette got the kick they needed to push them over the line. Four Golden Eagles finished in the top five and senior Omo Tseumah, who overcame the flu, capped off the event. She won her third high jump title and second straight with a jump of 1.70 meters, or 5 feet, 7 inches. Sophomore Monique Felix had the identical jump but Tseumah did it in fewer attempts and won the event. Coming in third were Bridget Bodee and Breanne Marchan who each had a jump of 1.65 meters, or 5 feet, 4 inches. Coming off of her pentathlon victory Friday and her second place finish in the high jump, Felix was named BIG EAST’s Most Outstanding Female Field Athlete for the second year in a row. Along with Felix, Terica Harris had a record-breaking afternoon, as the Savannah, Georgia, native was just one of four multi-event winners. She took home the individual title in the triple jump and the long jump Friday. 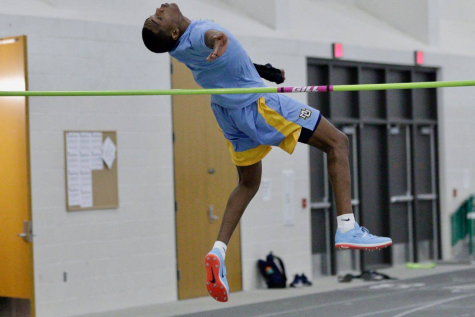 Harris’ triple jump of 12.41 meters, or 40 feet, 8.75 inches goes down as second best in school history. 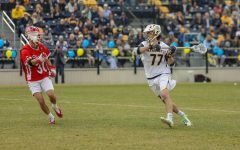 Head coach Bert Rogers was delighted in his team’s performance on the second day and said the emotions throughout the day helped lift the team. While Harris, Felix and her fellow high jumpers made the difference, there were other stellar performances from the women’s side as well. The Parker sisters fared well in the mile, as Jessica took fifth with a time of 4:48.53 and Jennifer took seventh with a time of 4:50.22. The eldest Parker, Alison, finished sixth in the 800. 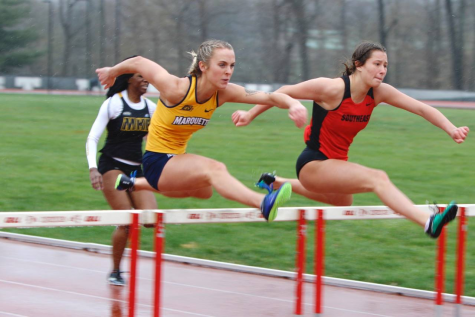 Cassy Goodrich took second in the 400 and fifth in the 200-meter dash, while her sister Alex finished in 10th in the 60-meter hurdles in her first BIG EAST conference meet with a time of 9.40 seconds. The 4×400 and 4×800 relay teams both took third with times of 3:48.43 and 9:00.46, respectively. Gemma Tedeschi vaulted her way to a second-place finish with a vault of 3.60 meters, or 11 feet, 8 inches. 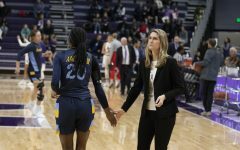 To top off the second straight BIG EAST crown, the conference named the Golden Eagles coaching staff the Women’s Staff of the Year. The men were not so lucky the second day, as their lead slipped away as the day wore on. 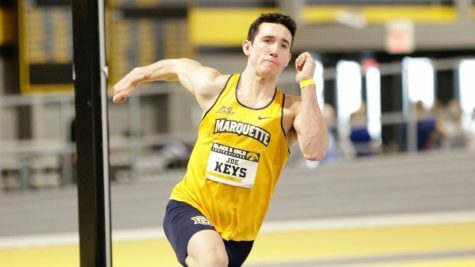 After leading at the end of the first day, the Golden Eagles still had a solid second day. 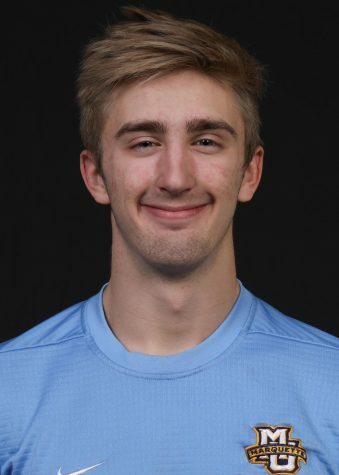 But thanks to a furious comeback by DePaul, Marquette finished runners-up for the third straight year. In the pole vault, William Ford took home his first BIG EAST individual title with a vault of 4.60 meters, or 15 feet, 0.9 inches. The other individual champion for the Golden Eagles was freshman Daniel Armstrong, who had a lifetime best in the high jump with a mark of 7 feet, 0.5 inches and ultimately set the school freshman record for the event. 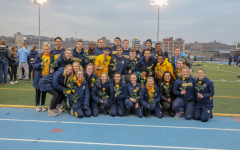 In the relays, where Marquette has excelled in the past, it was a career day for the 4×800 team, but it was not enough to catch DePaul. The team, featuring Greg Suarez, Derek Gross, Brad Eagan, and Alec Miller ran the fastest time since 1983, clocking in at 7:36.35. 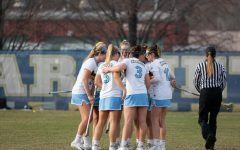 Although it was not enough to catch DePaul, the group helped solidify their second-place finish. 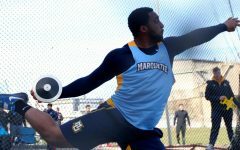 Other highlights on the men’s side included the triple jump, where junior Djdade Denson came back for the first time since December to finish second with a leap of 14.24 meters. 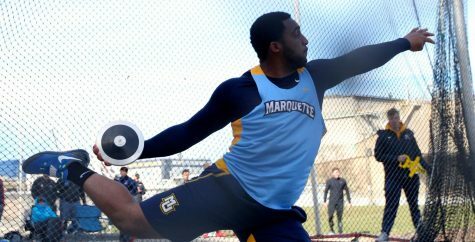 Denson has missed most of the indoor season due to a heart condition, and was cleared earlier in the week to compete. Denson took fifth Friday in the long jump. 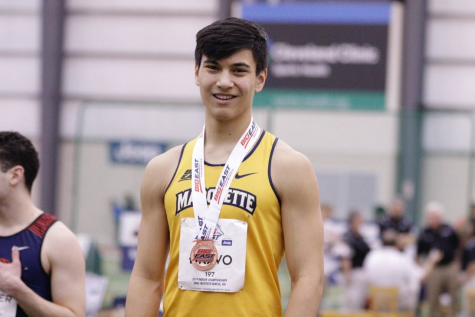 The Golden Eagles took fourth, fifth and eighth place in the triple jump, as Dwayne Dash Jr. finished behind Denson, followed by Alex Halloway and Cory Cegelski. Joshua Word set a school record in the 60-meter dash as he ran a 6.90 time that was good enough for runner-up. 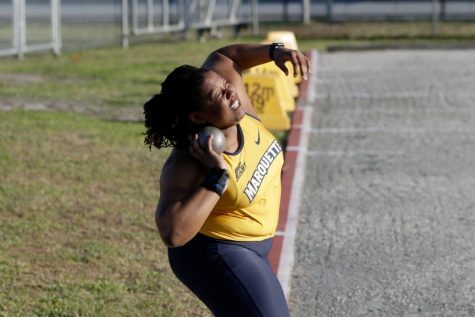 Next up for Marquette is the outdoor season, where both the men’s and women’s teams look to defend their BIG EAST championship. 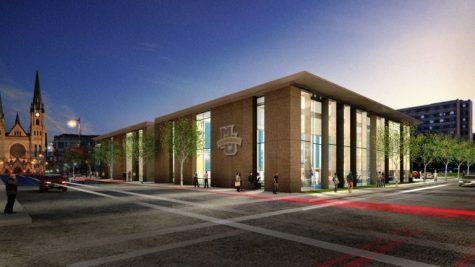 Their first meet of the outdoor season will be March 17.